An Indian company has featured among the 13 finalists for an international agriculture innovation competition here in the United States. 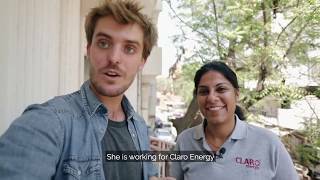 Washington: Claro Energy has been selected for its low-cost pay-per-use irrigation using solar trolley system, USAID said in a statement. In all, 13 companies from across the globe has been selected by Powering Agriculture: An Energy Grand Challenge for Development. Innovator Cohort will collectively utilise $12.9 million in funding to commercialise clean energy technologies and innovative business models that will: (i) enhance agricultural yields/productivity; (ii) decrease post-harvest losses; (iii) improve farmer and agribusiness income generating opportunities and revenues; and (iv) increase energy efficiency within the operations of farms and agribusinesses. “The 13 winning innovators are a testament to the power of how partnerships can have a positive, transformative impact in development,” said USAID Senior Deputy Assistant Administrator Charles North. “Powering Agriculture: An Energy Grand Challenge for Development demonstrates how we can harness the collective intelligence and entrepreneurship of innovators to help end extreme poverty by providing clean energy to feed the developing world,” he said. The finalists for the awards and the countries in which they will implement their projects include Ariya Capital Group (Kenya, Uganda, Tanzania) for powering agriculture with renewable energy, and Futurepump (Kenya) for sunflower pump: asset-financed solar irrigation pumps for smallholder farmers.